Assembly of the BMW i3 in Leipzig. Video: the BMW i3 concept. The i3 is being assembled at BMW's plant in Leipzig, Germany, where some €400 million has been invested in new structures and machinery for the production of BMW i models and 800 new jobs have been created. Today represents a milestone in our company’s development. We are making history with the BMW i3. Not only is our first electric car about to hit the road, we are also completely redefining sustainability with regard to personal mobility thanks to groundbreaking technologies and processes. The production network for BMW i also sees key components manufactured at BMW Group plants and joint venture facilities at Moses Lake in the USA (see BMW and SGL unveil location of US carbon fibre plant) and Wackersdorf, Landshut and Dingolfing in Germany. 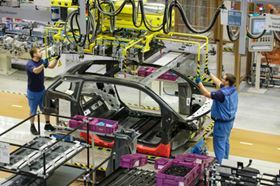 The company has invested a total of around €600 million in the BMW i production network and generated over 1500 jobs. Deliveries of the BMW i3 to customers in Germany and other European countries will begin in November, with the car’s launch in the USA, China and other markets to follow in early 2014. BMW counts on carbon fibre for its Megacity electric vehicle. AZL says that it has implemented adhesive-free bonding for FRP for the first time in large-series production with cycle times of less than three minutes. McLaren Special Operations, the bespoke division of McLaren Automotive, has announced the creation of the MSO Carbon Series LT.